Katekyo Hitman Reborn! Wallpaper: Burn! Minitokyo »	Katekyo Hitman Reborn! Wallpapers » Katekyo Hitman Reborn! Wallpaper: Burn! Hope you like and as usual, comments faves and CC are welcome! and im glad i could help my dear. Oh my gosh, this is so pretty im like amazed by this..O.O your vector of him is wow and your painting is awesome and this is your first time painting wow. I love everything about this your details are great your shading, blending the brushwork even the colors look great. I love how you did the fire and flames and his eyes..*sighs dreamily*. You did his eyes so good they look like the real thing from the anime or even better. I just love this..*smiles*. And from a really big Tsuna fan..*points to me*. THANK YOU SO MUCH..*gives you lots of cookies*..hehe. Anyways, love the fire-y effects you did. They look pretty awesome! waaaa it's beautifull *___*! I love how you made the fire *w*! Love the lighting and the flames you've done. 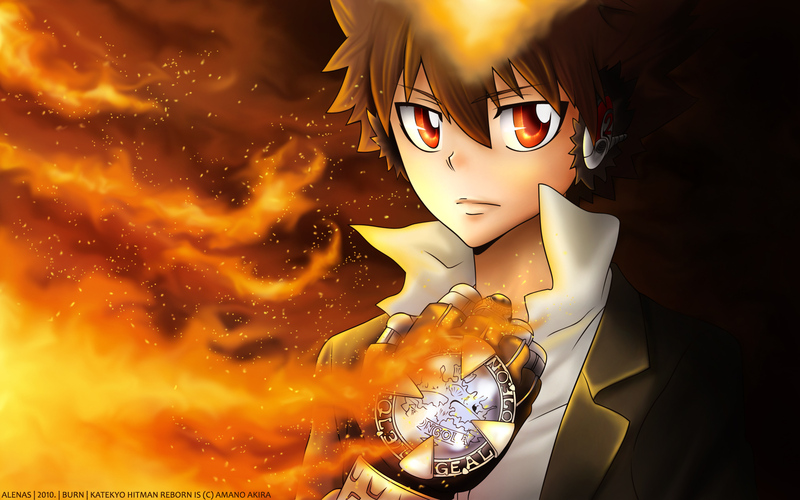 Tsuna, kyaaah, so awesome ?___? The fire is amazing *bows* I love how you did the shading on his clothes reflecting fire, it really looks great. Tsuna is awesome damn, but the fire is simply brilliant <333 I wish there would be more details on him, especilly in the eyes, headphone and the glove. I love the colors and the flames look amazing! oooh! *0* coool! nice coloring!? thanks for sharing! Lol why haven't I commented on it here too? D8 Buahaha love the flames, and yay for edits! I love it. His eyes look so nice. And the flame look great.